Christmas time and family go hand-in-hand, so it got us thinking about the rather familiar surnames in the Football League the season; Cole, Ince and Poyet to name a few. But how would a team made up of the offspring of English football's former players fare against their elders? BBC Sport has come up with an XI that could give their fathers a run for their money, especially given their ageing legs. In goal, while top-flight leaders Leicester City have Kasper Schmeichel, holder of one of the most familiar surnames in the Premier League era, there's another famous name down in the lower leagues. Former England goalkeeper Dave Beasant is probably best known for being the first player to save a penalty in an FA Cup final, when he kept out Liverpool striker John Aldridge's spot-kick in Wimbledon's 1988 victory. His son, Sam, had a lot to live up to and, after years of scraping down the lower reaches of non-league football with sides including Maidenhead United and Billericay Town, he finally made the step up to the Football League with Stevenage last year at the age of 26. Dave followed him to the Lamex Stadium as a goalkeeping coach - and when Sam got injured before their League Two play-off semi-final first leg against Southend, the ex-Nottingham Forest keeper even had to step in to replace him on the bench at the tender age of 56, becoming the oldest man to be selected for a match-day squad in Football League history. Both moved on at the end of last season - Sam is now at Cambridge United, while Dave made the move to Berkshire with Reading. Like father, like son. Leroy and Liam Rosenior both played for England at Under-21 level, but have never made it to full international honours with the Three Lions. Instead, former Fulham and QPR striker Leroy switched allegiances to Sierra Leone, earning one cap in an Africa Cup of Nations qualifying match against Togo in 1994 - though his son's head has yet to be turned. Leroy later went on to manage the West African nation in 2007, shortly after famously being sacked by Torquay United after just 10 minutes - still the shortest managerial reign in Football League history. Former Hull and Reading defender Liam, who played briefly on loan under his father during his first spell at the Gulls between 2002 and 2006, has made over 350 career league appearances and leant on his dad for advice before joining Brighton in the summer. Alex Bruce is a man very much in the mould of his tough-tackling, hard-hitting, nose-broken former Manchester United defender father Steve. Steve lifted the Premier League title three times for United, himself scoring two goals against Sheffield Wednesday to clinch the 1992-93 crown and give us one of the most iconic moments of the early Premier League era. Steve turned into a rather handy manager, winning promotion to the Premier League three times - twice with Birmingham and once with Hull. Now at Hull, he has his son as his defensive rock. And while Steve is widely regarded as one of the best Englishmen never to have played for the national team, Alex opted to play for Northern Ireland, eligible through his grandmother. A trend appears to be emerging. No, it's not having a dad called Steve - playing under your father seems to be typical among fledgling young defenders. Former Burnley defender Steve Davis may not be as big a name as some in the list, but makes the cut after giving his son Harry the captain's armband at League One side Crewe. And Harry is not the only Davis making his way in football. Brother Joe, once of near-neighbours Port Vale, is currently on the books of Premier League side Leicester City and out on loan at Fleetwood Town. At the time Josh Windass was born in January 1994, his father Dean was playing for a Boothferry Park-based Hull City side struggling to pay their bills in the third tier. Windass was sold to Aberdeen in 1995, but returned in 2007 to provide football fans everywhere with one of the most memorable Wembley goals as his Championship play-off final volley against Bristol City took the Tigers to the top flight for the first time in their history. Former Huddersfield youngster Josh fell out of pro football in 2012, put was picked up by League Two Accrington Stanley in 2013 while playing for Harrogate Railway Athletic. Since then, young midfielder Windass has been a revelation, scoring 11 goals in 23 games this season - prompting Stanley boss John Coleman to suggest he could become the Lancashire club's first £1m player. Uruguay midfielder Gus Poyet was one of the first foreign imports to make a real impact on the Premier League while playing for Chelsea and Tottenham, helping the Blues win the FA Cup, Uefa Cup Winners' Cup and Uefa Super Cup. He transitioned into management with Brighton, taking them to the Championship, before a spell at Sunderland ended in March with the club just above the Premier League relegation places. While Uruguay was an easy international choice for Gus, there has been somewhat of an international bidding war for his son - born in Zaragoza, Spain to Uruguayan parents and brought up in England. Diego, who was Charlton's 2013-14 player of the season before a move to West Ham United, played for the Three Lions up until under-17 level, but switched allegiances to Uruguay in the same month as his father was sacked as Black Cats boss and played for their under-20 side. Will Spain be the next to come calling? During the mid-to-late 90s, John Moncur made his name as a passionate and combative midfielder for West Ham United, earning plenty of yellow cards and a few reds along the way. Away from the pitch things were not looking great for Moncur, who classed himself as a binge drinker, and it took a nasty altercation where he hit someone outside a nightclub for him to change his ways. He told The Observer in 2003: "My wife Kerry was pregnant at the time with our first son, George, and I was thinking, 'I could have killed someone, I could get banged up here for manslaughter, Kerry's at home pregnant and I might not see my child again'. "I basically made a deal with God while I was praying that if the boy was all right, I'd change my ways." John became a Christian, a faith his son George shares as he plies his trade for Colchester United in League One, where he won August-September's PFA fans' player of the month award. 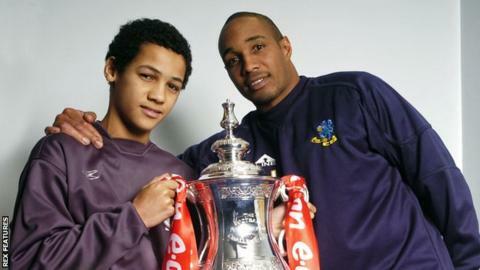 Former Manchester United, Liverpool and England midfielder Paul Ince and his Derby County forward son Tom were always shoe-ins for this list. While Paul earned 53 international caps and the nickname of the 'Guv'nor', fleet-of-foot 23-year-old Tom has impressed at the Rams but is yet to earn a senior call up, instead picking up 18 under-21 caps. Sometimes fathers have a tendency to think the world of their sons, and Paul believes Tom can be as good as Real Madrid and Wales star Gareth Bale. No pressure, then. "You'll never beat Des Walker" was a famous chant that rang around English stadiums in the late 80s and early 90s. But, be warned young defenders, the former England man believes one day his son Tyler will be even more feared he was. The 19-year-old striker, who has scored once in 12 games for Nottingham Forest this season, has more ability than his father ever had, according to Des. Tyler certainly has a lot to live up to - after all, his defender father won just the 59 England caps from 1988-93 - though he has already managed to pass Des' total career tally of one goal. When your son reaches the pinnacle of his career, you usually want to be there embracing all the emotions of the moment alongside him. For Mark Chamberlain, father of Arsenal and England winger Alex Oxlade-Chamberlain, he was fast asleep when his son scored against Brazil in the iconic Maracana stadium in 2013. "I didn't see it. I was dropping his mother off at the airport at 6am this morning so I fell asleep," the former Stoke City and England player said. Let's hope if 'The Ox' scores a Euro 2016 goal his dad will have had a shot of caffeine before the game. One of the truly "Outstanding" players of the Premier League era was former Newcastle United and Manchester United forward Andy Cole who, in a club career spanning 19 years, scored 290 goals in 648 matches, as well as winning 15 England caps. A man who has five Premier League titles, two FA Cups and one Champions League to his name, his son will always have a tough job of emulating him. But Devante Cole is certainly doing his best. The 20-year-old took the drastic move to leave Manchester City in the summer to drop down two divisions to Bradford City, where he has scored six goals in 20 matches so far this season.